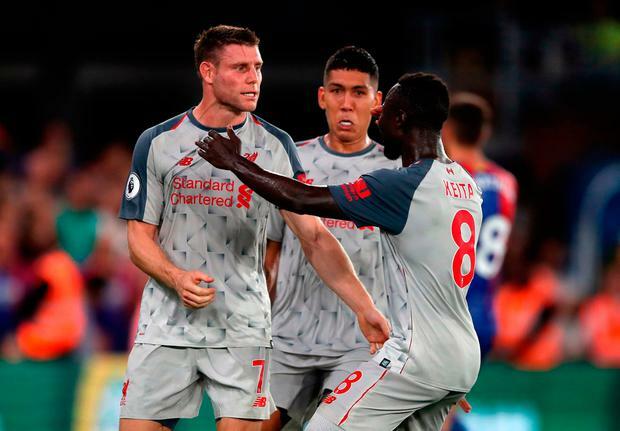 James Milner beat Wayne Hennessey from the spot after Mohamed Salah went down late in the first half under minimal contact from Mamadou Sakho and the frustrated hosts' hopes of a comeback were ended when Sadio Mane scored a second in stoppage time - if not earlier when Aaron Wan-Bissaka was sent off. Jurgen Klopp's second-placed teamed join title rivals Manchester City, Tottenham and Chelsea on maximum points. The typically-influential Salah squandered a chance to give Liverpool the lead when, after Naby Keita floated a fine ball over the top of the hosts' defence, he struggled to control and consequently chipped harmlessly over the crossbar when he should have had time and space to finish. Palace produced an almost instant response when Andros Townsend cut in from the right wing, racing into space towards the edge of the area and on to his left foot, before curling an effort against crossbar. Wilfried Zaha's rebound took a deflection and went out for a corner. Salah had also had a further attempt deflected away from danger when, in the 44th minute, he was challenged by Sakho, his former team-mate. Despite the defender's clumsiness, he made minimal contact with the Egyptian, whose dramatic fall was followed by referee Michael Oliver awarding a penalty. As was consistently the case during his first 12 months on Merseyside, Salah remained his team's leading figure and early in the second half created space for Keita to shoot, from where he struck wide. Since Roy Hodgson's appointment Palace have made a habit of recovering from losing positions and, in the 53rd minute, they threatened to do so again after Trent Alexander-Arnold fouled Zaha on the edge of the area. In the pursuit of a point Hodgson replaced the ineffectual Christian Benteke with Alexander Sorloth, and handed Max Meyer his debut, and then watched Zaha test Alisson when chesting down and shooting from Wan-Bissaka's right-wing cross. The improving defender, 20, had also been impressive in last week's 2-0 victory at Fulham, but his first senior red card followed in the 75th minute.